Bits of Splendor: She would be 6. Today was Grace Ann's day. The day I first held her. The day I said goodbye. In years before I've grieved over the tiny baby I held that day. The little one I never knew. The one wrapped up tight in a newborn hospital blanket. But the other night I sat in Bella's empty room alone. We had cleaned it all out to move her into the room with Mia. Things had been pulled out from under the bed, drawers and deep inside her closet shelves. 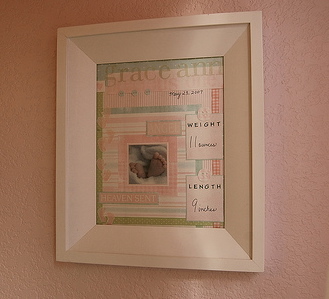 One of those things was the frame my sisters made me for Grace Ann. With all of her birth stats. I sat down on the floor and stared into the words written in black ink. Her tiny size. She was so little. I looked at the date. May 23rd 2007. "She would be 6 years old this year"
I haven't let myself go there before. Imagine what it would be like to have a 6 year old daughter running around here. Chasing after Asher. Calling out my name when he got on her nerves. What would she look like. What would she sound like? What would her personality be like. The tears started to come quicker than I could stop them until I was finally just crying. Something I don't always let myself do. I think partly because I'm afraid I won't stop. And partly because I fear people will wonder why I'm grieving so hard over a little girl I didn't know. Especially since I have a beautiful one who came just a year after. If I'm truthful that's really what it is. For imagining her here on earth. Because if she were here, then we wouldn't have Bella. And that thought alone is enough to stop me in my tracks and wipe away the tears. Keep moving forward. Keep looking forward. It's what I know to do. "Grace was sick. She's perfect and healthy in heaven now. You have Bella. Sweet beautiful Bella. Wipe those tears, you have no reason to cry"
I've cried many times for the tiny baby I held in my arms 6 years ago. But the other night I let myself cry for the little girl who would be 6 now. There's a part of my heart that aches at the thought of her. Aches with guilt when I miss her. because I hold on to the hope that I will one day. treasuring and loving every bit of what is now. It's ok to say "She would have been 6"
I can't help but think today about the many of you who read my blog, because you know our story. And because you can relate in some way. You've lost your own little baby too soon. I want you to know that you are why I continue to write my story. Every time I begin to doubt myself or start to want to step away, an email will pop up in my inbox, or I will hear from a mom who is hurting from her own loss. Or a sister, a grandma, an aunt, a friend who knows someone that lost a baby. Searching for something to hold on to. For hope. Today, I'm thinking of you too. I'm praying for you. That the steps of grief are gentle but complete. That you find ways to reach out to others who are hurting and help yourself heal in turn. Don't be afraid to let your heart go where your mind won't often let it. Allow the tears to come when they need to and smile with joy for the treasures in front of you. Because there are truly so many to find each day. Keep moving forward, keep looking forward. Hold tight to His grace. To hope. To the knowledge that we will one day hold our sweet babies again. And cry when you need to. Awe! sweet post! You are brave! I find so much strength in reading this post. We lost our sweet son at 5months this past October. I have 3 healthy children and often have days of guilt because I am overwhelmed with grief, but "just keep moving forward" so that I am not selfish. I am extremely blessed to have 3 healthy children and I do not take it for granted for one second. I miss my son though and I need days where I feel that to the full extent. I'm sitting here tears streaming down my face and I never realized it until your last line. My heart hurts for you and for every single other mama who has felt loss of their little one. My whole heart goes out to you sweetie...it may have been 6 years ago already but in retrospect 6 years was like yesterday. you did know her. she was YOURS. you knew her deeply more than anyone on earth. she is your baby girl. no guilt in missing her every day. no guilt. mamas are MADE to love and miss their babies. no matter how long we get to keep them with us. you are so brave to share your story ... love your heart. weeping at your beautiful, touching words. you DID know that sweet girl. and i did know my little baby 10.5 years ago. even though i never actually held him/her in my arms. those precious babes are in the arms of jesus! Oh, this was beautiful. My thoughts and prayers are with you.